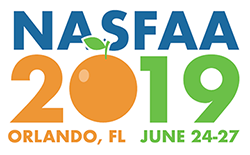 When you register for the NASFAA Conference, please indicate "Yes! I want to earn AFCPE CEUs". If you have already registered and did not indicate your intent to earn CEUs, please email smiths@nasfaa.org. Upon completion of the conference, each participant must complete the Proof of Participation section on the CEU Form. For more information on AFCPE CEUs, please visit their continuing education credits page.